Who Made of Elements Wooden Coaster: Spice up your coffee table or desk with these handcrafted, custom wood coasters made with beautiful Maple plywood! Made in the USA from sustainably harvested woods, these vividly-printed coasters are a great way to display your favorite design to compliment your home décor. Pair these with our coaster holder accessories for elegant display options that will suit your décor needs. Whether you buy an individual coaster or a set, these coasters are the ultimate way to make a statement while protecting your tabletops and will inspire conversation at the table! Check out other products with this design or view all . 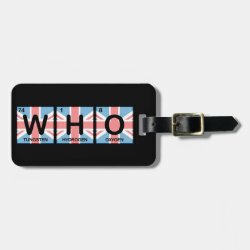 This wooden coaster with our Who Made of Elements design is made-to-order by Zazzle.com. Zazzle offers 100% money back guarantee on our high quality Cute Union products. In case you are not happy with your purchase, you can always return your wooden coaster for an exchange or refund within 30 days of receipt. See customer service for more information.